The doom and gloom of the DC Extended Universe's first few efforts is beginning to feel like a distant memory, and the course correction that began with Wonder Woman and continued with Aquaman carries on unabated with the release of Shazam. This may not be the best film that Warner Bros. has crafted with its arsenal of DC Comics personalities, but when it comes to sheer fun and enjoyment, it's impossible to top. For the uninitiated, Shazam is the super-powered alter-ego of Billy Batson (Asher Angel), a teenage orphan granted immense power by a dying wizard. Right out of the gate, this concept sounds a bit ridiculous even for a movie based on a comic book -- luckily, director David F. Sandberg makes the wise choice to lean directly into the silliness of the premise. When the wizard (Djimon Hounsou, hamming it up spectacularly) commands Billy to speak his name in order to receive his power, Billy tries (and fails) to stifle a laugh, and the audience is right there with him. But when Billy finally gives in and utters the word "Shazam," he finds himself transformed into a musclebound adult in a skintight red suit, emblazoned with a huge yellow lightning bolt. This version of the character is portrayed by Zachary Levi, whose ability to channel teenage exuberance is the glue that holds the film together. In one of Shazam's best sequences, Billy enlists the help of foster brother Freddie (Jack Dylan Grazer) to test the limits of his abilities, and Levi perfectly captures the childlike glee of being a fifteen-year-old who just discovered he's been granted godlike superpowers. 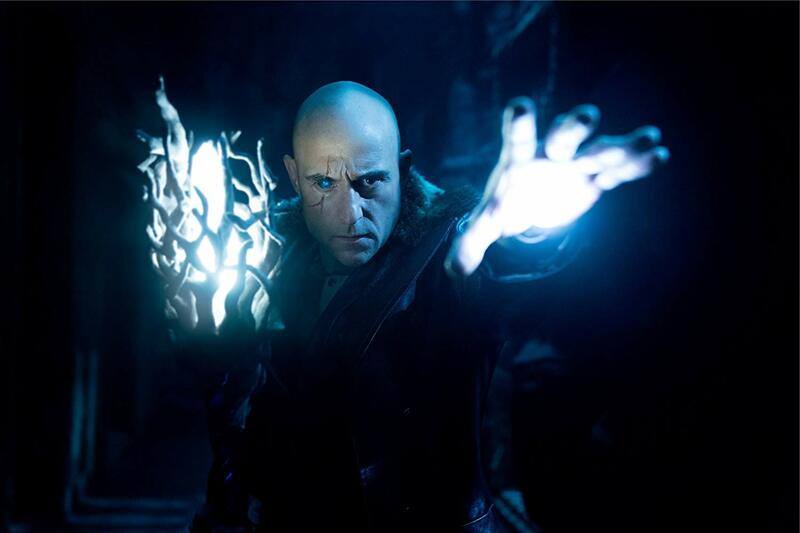 Elsewhere, the seven deadly sins, manifesting as grotesque creatures with leathery skin and glowing red eyes, have been unleashed by Dr. Thaddeus Sivana (Mark Strong, in his second run at playing a DC villain). As a boy, Thaddeus endured years of emotional abuse at the hands of his father and older brother, and he has no qualms about paying it back tenfold now that he commands an army of demonic entities. Strong always makes for a great villain, but Shazam allows him to dial it up to eleven with numerous monologues and grandiose pronouncements, such as "the weapons of man draw no blood from our kind." With his shaved head and scarred face, not to mention the shimmering blue gem embedded in his eye socket, Dr. Sivana exudes menace whenever he appears onscreen. Billy's superhero persona may seem like more than capable of dispatching the good doctor from a physical perspective, but mentally he's still just a kid, and his "fight or flight" instinct immediately defaults to the latter. There's something undeniably comical about watching Levi in full Shazam regalia fleeing in terror through a crowded shopping mall, and as an added bonus, this sets up a pitch-perfect reference to the classic Tom Hanks comedy Big (you'll know it when you see it). Sandberg, whose previous credits include Lights Out and Annabelle: Creation, makes ample use of his horror roots for the scenes featuring the seven deadly sins. It's a striking contrast from the overall upbeat tone the rest of the film employs, and parents should exercise caution with younger viewers who may find the creatures a bit too scary. But Sandberg is far from a one-trick pony, deftly balancing the humor (of which there's a plethora, more than any other DCEU film) and the heart. The film doesn't shy away from the tragedy of Billy's childhood and the years spent searching for his birth mother, nor does it pay short shrift to the foster family that takes him in, which comic readers will recognize as an important part of the character's mythology. 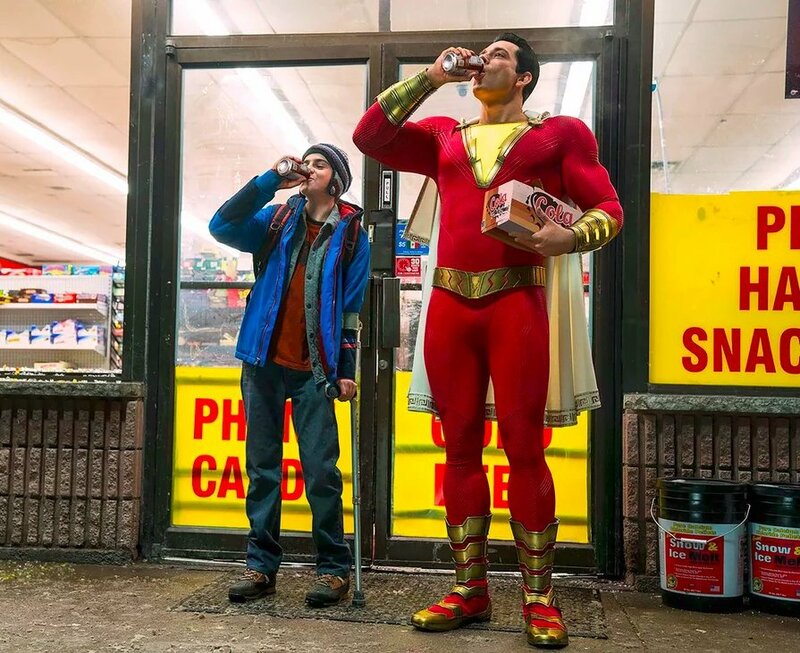 Thanks to a script filled with razor-sharp quips, a fully committed performance from Levi, and an unapologetic embrace its own goofiness, Shazam is an absolute blast. This is the kind of DC Comics film that Warner Bros. should have been making all along, and they've truly knocked it out of the park here -- Shazam is far and away the most fun I've had in a movie theater this year, and I can't wait to see more of this character in the future.